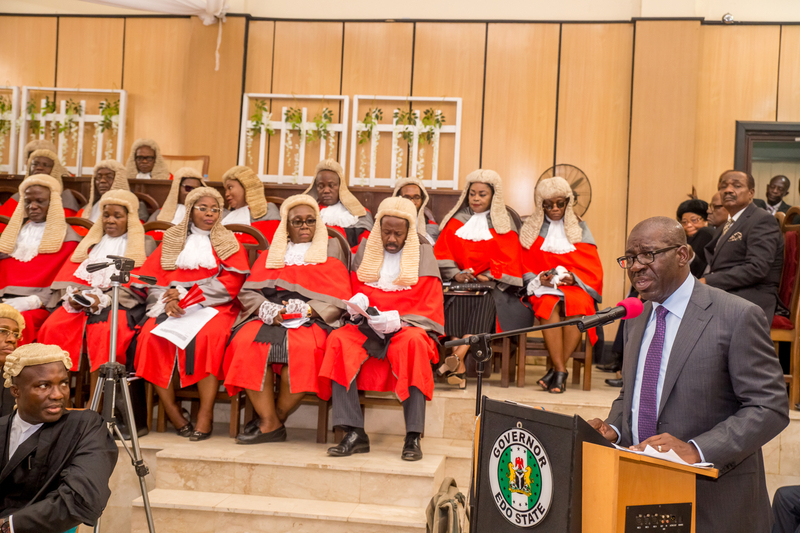 Edo State Governor Mr. Godwin Obaseki has revealed that his administration has orchestrated an increase in capital expenditure of the judiciary from 280 million last year to 1.8 billion this year. This constitutes a 15.56% increase set aside by the governor to improve the infrastructure of courts in Edo State. Governor Obaseki made this disclosure at the valedictory court session held in honour of the outgoing Chief Judge of Edo State Hon. Justice Cromwell Osamwonyi Idahosa at High Court 1, in Benin City Edo State. He noted that all the steps his administration had taken so far, was due to the hard work done by Hon. Justice Idahosa, and the confidence the government had in his person. Moreover, Governor Obaseki expressed confidence in the creditability of the incoming judge hailing her as a “straightforward jurist”. “I am grateful that you are handing over to someone that has been classified as a classic judge. With my interaction with the incoming judge, Justice Esohe Ikponwen, I have no doubt in my mind that we have a fearless, honest and straightforward jurist”. He said, “The government has decided to increase the capital allocation for the judiciary. In this year’s appropriation, we have increased the amount of capital expenditure of the Judiciary from 280 million last year to 1.8 billion this year. We need to do that so that we can improve the infrastructure of our courts; we need to do that so that Edo State will be attractive for judges to come and live and preside over cases”. According to Governor Obaseki, “We will make sure we facilitate the location of an Industrial Court here in Benin City, and we have decided to relocate the Court of Appeal from its current premises to a better one close to the High Court”. Speaking further, the governor also disclosed that his government is holding talks with the Ministry of Interior to acquire the prison at Sapele road and relocate it in order to expand the court premises. Meanwhile Justice Idahosa said that as Chief Judge, the opportunity presented itself to contribute his quota to the development of the judiciary. He noted that in his time, the creation of a Criminal Court became possible. He also mentioned that his tenure laid the foundation for the take-off of the Family Court in line with the Child Right Act of 2007, set up a website for Edo state judiciary to file and document cases electronically as well as set up a monitoring division to check corrupt practices in Edo State Judiciary. Pic 2067: Governor Godwin Obaseki delivering his Keynote address at the valedictory court session held in honour of the outgoing Chief Judge of Edo State Hon. Justice Cromwell Osamwonyi Idahosa at High Court 1, in Benin City Edo State.